Dermarolling / Microneedling / Will the roller leave tiny prick marks on facial skin? I'm not sure about how much of an expert she is in skin matters (there is quite a difference between a beauty expert and a dermatologist or plastic surgeon). Of course it is impossible to prove a negative and perhaps there do exist people who end up with permanent prick marks, so all I can do is advise you to do a test patch on your thigh first. If your skin responds normally, then you can do a small test patch on your face. Again, if you respond normally, you can do the rest of your face a few days later. Facial skin differs from other skin in that it has a large number of sebaceous glands, visible as "large pores". Those glands can become more prominent after rolling due to swelling, but that should subside rather quickly. Their typical customer is often rich enough to sue for damages if they end up with permanent scars, so plastic surgeons would not continue to offer this treatment if this was the case. Be advised that rolling with 3 mm needles is not at all required for very good results. 3 mm needles penetrate so deep that the face becomes a bloody mess. There is no need to go that deep. This is the opinion of the patent holder of the Dermaroller™ and he is not alone in this. It seems that plastic surgeons roll with such long needles in order to impress their clients, giving the impression that they must visit a clinic instead of home-roll for good results. This is the leg of a 40 year old customer of ours, who allowed us to use this image. No blood involved with 1.5 mm rollers. The image below is a magnified closeup (about 3 x actual size) of the leg right after rolling. Note how there is not even pinpoint bleeding. And the absence of any "holes". The "holes" immediately close and the red prick pattern disappears very quickly. She will make a picture a few days from now, to demonstrate that nothing visible remains. The same is the case with the skin on the face. However we can't be absolutely certain that there aren't any rare exceptions, this is why we advise to do test patches first, to see whether your skin responds as it should. I am not aware of any of our customers ending up with permanent facial prick marks, not even after having sold thousands of dermarollers. But that doesn't neccessarily mean it is impossible - hence the recommendation to do a small area first. Weeks later, the skin looks indistinguishable from unrolled skin. Just relax and use it as much as you are comfortable with. Vit. C has quite a long half-time so you don't have to do it too often. A couple of days before rolling is important. If you keep the vit. C on the skin for hours, you can get away with less days of using it. Two nights on the skin before rolling would be excellent. All you do beyond that is nice, but not essential. Red spots are usually just hyperpigmentation, not scars. They are OK to roll, provided you do not roll over skin with serious active acne (having pus..). 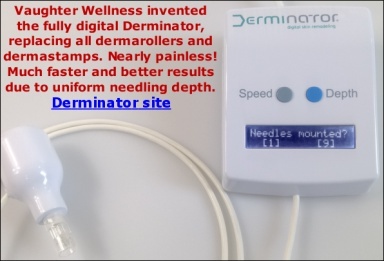 Many people claim these post pimple or post bug bite pigmentations disappeared after using a dermaroller. I have also heard that some people use adhesive tape, stick it on the red spots and slowly remove the tape (do not remove it abruptly because this is too harsh for the skin). I have no idea why should this work or whether it does at all. The action of tape-removal may bring blood to the spot and accelerate healing (just my theory). I am not advocating this - I just wanted to make you aware that this technique exists. What I do recommend is using a dermaroller and then applying a cream or spray with Pantothenic Acid or Dexpanthenol. Continue applying the cream or the spray until the spot is (hopefully) gone. It depends. If the scar is still raised after 8 weeks, you should perform pressure massage or whatever scar management you were advised by your surgeon. You can needle the scar after 8 weeks, provided that is not infected. Do a small patch first to get an idea how it will heal. Put the silicon sheeting back on. Needling cannot make the scar disappear. The cut is throughout all skin layers but it can soften the scar and change its appearance to be more naturally skin-tone. Yes, we have a customer who needled lipo scars but they were not indented, they were just white scars. She achieved the breakup of the scar - tiny parts of the scar became normal skin color, which is great because it camouflages the scar. A vit. C solution is very watery. It is basically water with an acidic taste. You do'nt rinse vit. C off your face. It should stay. If you want to rinse it because you do not want to have an acid taste , leave it on your skin as long as you can (overnight is good) and rinse it off in the morning. If you find it makes you sticky, add more water to the solution. The crystals are very stable - much more so than the solution but keep them dark, dry and in a closed bag or container. Vit. A is essential for the normal functioning of skin cells. Although I don't think that any cream can make wrinkles disappear, it may improve skin texture and help prevent the skin drying out. There is no reason why an ointment could not be put around the eyes. The difference between the base for an ointment and a cream is that the ointment is much greasier. Do take care not to get ointment into the eyes though. Vit. A is fat soluble. That's why it often in greasy creams. The skin around the eyes is usually dry, especially as we age and it can benefit from an oilier basis. Give it a try and you will see (patience required). If you are not happy - just stop using it. Do not expect the wrinkles to disappear though. If you are lucky you might get a little improvement. We have moved our dispatch center to a country with very low shipping fees. You'll notice that you'll pay a mere 2.5 USD for a double refill of vit. C crystals. So you pay 6.5 USD for 40 grams including shipping. A single refill is only 4 USD incl. shipping. Also the shipping cost of everything else is greatly reduced, making it much cheaper to order for ex. single needles or copper peptide masks. To see the cost of shipping, click on the "Estimate shipping" button when you're viewing your shopping cart. It depends on the cause of your hyperpigmentation - whether it is an inflammation or a localized overproduction of melanin. Melanin is the pigment responsible for our skin color. Albinos have no or almost no melanin. When we expose the skin to the sun, our skin reacts/protects itself by producing more melanin and our skin darkens. Melanin absorbs the UV radiation and transforms it into harmless heat. When melanin production is for some reason uneven, we end up with hypo- or hyperpigmentation caused by uneven distribution of melanin in our skin. That can happen when our skin is for example injured (such as after laser treatment) and we expose the unprotected skin to the sun before being completely healed. That is why you must protect your skin from the sun after deep dermarolling. I'm constantly “fighting” with people who refuse to avoid the sun even for one day after deep dermarolling..
Freckles are also localized melanin. Unfortunately, inflammation (which is an immune protective response in order to fix the injury) can trigger the production of melanin even without sun exposure. Certain products or inflammation can stimulate melanin production in susceptible individuals. It is more common in dark skinned individuals. It is called postinflammatory hyperpigmentation. Melanin can either appear in the epidermis or the dermis (deeper in the skin). Hydroquinone is a tyrosinase inhibitor. Tyrosinase is the enzyme that converts tyrosine to melanin. Hydroquinone thus lightens dark skin or lightens hyperpigmentations caused by melanin. If the hyperpigmentation is not caused by melanin, hydroquinone will not have effect on it. Unfortunately there are issues with hydroquinone. As far as I know it is banned in Europe and only low-percentage hydroquinone is sold over the counter in the US. There were some issues with its potential carcinogenicity with long term use. Low percentages available OTC are approved by the FDA so it should be OK. Furthermore, in some individuals prolonged or/and excessive use of a high percentage hydroquinone (above 3% for 6 months) in combination with excessive sun exposure caused exogenous ochronosis – bluish black pigmentation that is more or less irreversible. It happened very rarely and only in individuals who overused high concentrations. You can use a 0.2 mm dermaroller to enhance the penetration of hydroquinone to the dermis but do not do it for a prolonged time. The best protocol is 3 month on, 1 month off and so on. What you could try is to very thoroughly clean a lemon skin. Using a fork, make the skin leak its juice and put it on your pigmentation. Cover it with plastic foil. Follow this procedure several times a week. If your pigmentation is due to inflammation, do not use the lemon peels. It would further irritate the skin. If your pigmentation is not caused by melanin (it should be a brownish color if it is), it might be caused by chronic skin inflammation (reddish color). In that case you have to use anti-inflammatory products such as topical corticosteroids. They have issues as well and should not be used long term. They sell OTC corticoid ointments in the pharmacies. You can also try to put several drops of water onto an Aspirin tablet which is an anti-inflammatory (Paracetamol is not Aspirin! ), apply it on your pigmentation and cover it with plastic foil. lines around the mouth...and..."turkey neck". I have, I suppose, mild rosacea. The problem is that current medicine doesn’t know the cause of Rosacea. There are many theories about its cause but none of it has been convincingly proven. That is why it is difficult to answer the question what can have an adverse effect on Rosacea. Theoretically it can be just about anything. Infadolan contains Retinyl acetate that is slowly converted to Retinoic acid in the skin. There are quite some cases in the literature reporting that Retinoic acid had an adverse reaction on Rosacea. Neither would I recommend copper peptide mask. You can try much diluted homemade vit. C serum and you will see. I think that EMLA should be OK. Instead of Infadolan, you can use a little bit of Vaseline after the rolling. The best is to buy Vaseline in a tube to avoid its bacterial contamination. Or at least buy a new jar. Dermarolling is not recommended if the skin is affected by Rosacea. Neither are dermabrasion or chemical peels. If your case is very mild, you could do a test patch and see how your skin reacts. If Rosacea is not too much of a problem around your lips, you could give it a try. Wrinkles around the lips are very stubborn and several dense and deep rolling sessions are needed to get improvement. That area is also very sensitive. I can roll my whole face without a topical anesthetic with the exception of the areas above and below the lips. Even with EMLA it is not exactly a pleasant experience but it is worth it. Use a 1.5 mm roller for the face. You can use the same roller on your neck but do not push the roller too much because the skin of the neck is thinner. Do a small test patch first. It is really unpredictable how your Rosacea will react. Keep in mind that you will be temporarily red from rolling. If the skin above your lips doesn’t have Rosacea, dry brush it with a new toothbrush several times a week prior to rolling. Again do a test patch first. If you feel that your skin doesn’t react well, stop using it. If the skin there has Rosacea, do not dry brush. Steaming the face to make it easier for the needles to penetrate (as we recommend in our instructions) is not a good idea in case of Rosacea. Green tea (keep it in the fridge and renew frequently) is a good skin toner for Rosacea. It has anti-inflammatory properties and a soothing effect. It depends on whether your expectations are realistic..
Acne prone skin can usually be improved by the anti-androgens in oral contraception. Acne scars are very difficult to improve, making it a long term project with limited results. There is currently no method to completely remove acne scars, scars or stretch marks. Unfortunately you have to accept the fact that they can be improved but not removed. Neither it is realistic to expect that a roller or TCA will make you look 10 years younger, stop aging or completely remove various skin problems. In some cases, improvement can be very significant - such as in certain cases of seriously sun damaged skin where the before-and-after is really impressive. Rolling is a great way to reverse sun damage, improve skin texture, improve or prevent wrinkles and mild skin laxity, improve scars and stretch marks, speed up skin turnover and so on. But one has to keep in mind that this improvement will be to a certain extent only and patience and perseverance are key points. And yes: The results of dermarolling are highly individual. We have customers that are extremely happy with their results and also those who roll and roll and do not achieve any significant improvement. There aren't many ways to rejuvenate or remodel skin. One of the best methods is to cause mild skin damage. Our body will renew the skin by fixing that damage. That is one of the principles of dermarolling. Only tiny fractions of the skin are damaged by dermarolling, that's why it heals so quickly. Mild skin damage is also a principle behind chemical peels. It destroys/removes the outermost top layer of skin. The same with laser rejuvenation. Lasers either remove the outermost topskin layer or they damage fractions of skin. As you can see, this triggered skin regeneration is what makes the skin renew itself. The result of this regeneration should be better looking skin. Give your skin plenty of time to regenerate. I think it would be wise to avoid any rollers for at least 3 weeks and 1.5 mm for at least 5-6 weeks. Avoid dry brushing or rough exfoliation for some time. Basically leave your skin alone. Keep it clean and moist. The most important part is to protect your skin against the sun since skin's protective means are compromised after TCA or other rejuvenating methods. Dermarolling / Microneedling / Frequency of use of copper peptide masks? The mask should be used after rolling. You can use it every week after rolling with a 0.20 or 0.25 roller, or less frequently when rolling with longer needles. I have used it twice with a 1 mm roller, 3 weeks apart. The concentration of copper peptides is quite high and the rolling will greatly enhance its penetration so if it is too strong for your skin, do not use it immediately after rolling. Use it in between the rolling sessions or a couple of days after dermarolling. As is often the case, the optimum interval is individual. I used it immediately after rolling (I washed my face with tap water after rolling and applied the mask) and everything went fine. However, not everyone can tolerate a high concentration of copper peptides without turning red, temporarily. Just to show you how difficult it is to give some general advice: I once applied 0.025% Retin A immediately after rolling with 0.20 mm and I ended up with badly stinging skin for hours. It was really unpleasant. I know people who do likewise but not experience any stinging. What am I supposed to advise our customers? I advise them not to use Retin A after the rolling because I prefer to stay on the safe side. But you are free to see how far you can go. By the way, when I took the mask out of its packaging, there was a bit of copper peptide liquid left in the sachet. I closed the sachet with paper clips and put it in the fridge. I used the remaining liquid some days later. Just rubbed it in my face. A dermaroller seems to be much more effective with acne scars than with large pores. Large pores are basically ducts in the skin and they just don't seem to get much smaller. Some customers succeeded in getting their pores smaller with dermarolling but I have to admit that they are in the minority. At least what has been reported to us so far. You should first try to use a dermaroller (every month) on your nose. Give it at least six months. Large pores really are very hard to solve. We have customers who had a dermabrasion in order to make the pores smaller and it actually made their pores more prominent and other customers were happy with the result of dermabrasion to help with large pores. We got more than one email from people who spent thousands of dollars for Fraxel laser treatment for their large pores and they got no results whatsoever..
We are basically cheating the body by dermarolling. We cause tiny skin micro-injuries by rolling. Our body immediately starts to fix the damage and thus we trick it into producing new skin. Collagen production starts very quickly but eventually those initial types of collagen are replaced by different types of collagen. Maturation can take several months. If you roll every month for example, the effect is cumulative. Nevertheless our skin continues to age, it continues to be damaged by sun exposure etc., A roller can't stop aging or block the sun damage. The texture and quality of our skin is largely determined by genetic factors. If your skin has large pores, you cannot expect that a dermaroller will turn it into an even, peachy, perfect complexion. None of it is better or worse, really. You should do what is doable, convenient and pleasant for you. Usually people use 0.20 or 0.25 on their face up to three times a week and 0.5 on the body (for cellulite etc.) All of those needle lengths used for skin product penetration enhancement. I also think people should stick with a routine that suits them, one they can make the time for. Dermarolling should not become some kind of unpleasant duty. Not everybody has sufficient time or energy to roll three times a week for product penetration. Which shouldn't be a problem. Just roll once a week or even once in 2 weeks. Whatever is comfortable for you. Better to roll every week for a year or more, than several times a week and you'll give up after a month or two because it has become too much of a drag. Sorry for this late answer. I have been flooded with email questions recently..
We have a customer who soaked her roller in 70% isopropyl bought in a dollar store and her roller got loose needles (isopropyl is a solvent). You do not have to disinfect your skin if using short needles (0.25 or shorter). Just wash your skin with your usual cleansing method before you roll. Wash or shortly soak the roller after every use in water with a little dishwashing liquid. Then soak the roller in disinfecting alcohol such as ethanol. This is especially important with rollers that have longer needles. Yes you can. Dermarolling the lips can sometimes trigger cold sores in people that are very prone to them. The lips are very sensitive because the skin is very thin, so rolling the lips will likely be painful for most people. If you can take the pain (or use a numbing cream) and if you are not very prone to cold sores than there should be no problem. Do not forget to disinfect the lips. The mouth is full of bacteria.